Julio 2011: Papel picado en calle Pipila. ¡Disfrutar! My first visit to Puerto Vallarta was in July of 2011. “Hot, rainy, loud and confusing” is how I would describe it upon arrival; upon leaving: “Warm, tropical, fun, and memorable.” It’s amazing what 10 days in sunny México can do for a solo traveler on their first visit. I began searching for accommodations soon after I booked my flight. Knowing I wanted a kitchen, I searched for apartment hotels, and found one high on a hill overlooking the Centro district. Hotel Suites La Siesta was recommended by TripAdvisor for it’s spacious rooms, shimmering pool and picturesque view. In actuality, there was no air conditioning in the room, the pool was drained a few days after arrival, and the soundtrack to the picturesque view was construction on the new Malécon, day and night. Yes, my first visit to a beach town left little access to the actual beach. Instead of leaving early, I stayed and had a great time, eventually enjoying my little apartment and getting to know the friendly hotel staff, as well as many restaurant owners and merchants on Calle Moreles. I ventured out every day: meeting Nationals visiting for their holiday season, touring scenic islands and enjoying horseback riding, all while tasting some of the most delicious food I’d ever had. 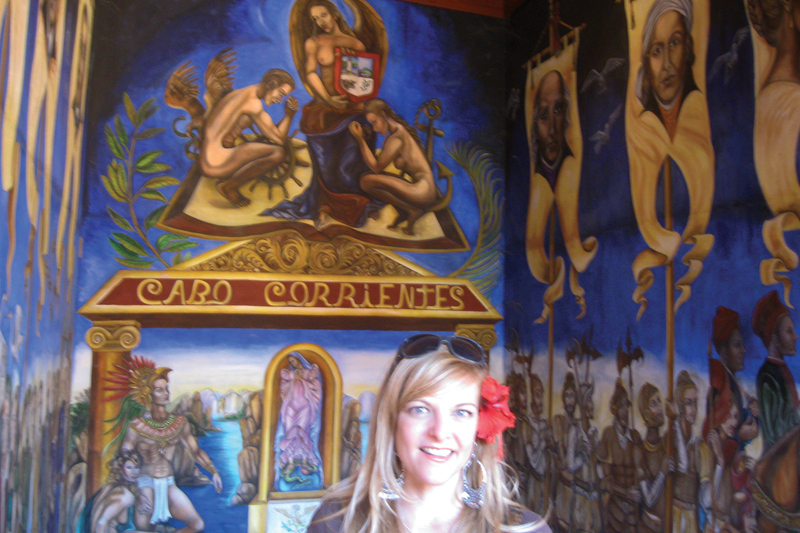 I went on some incredible tours to scenic locations, including John Houston’s breathtaking Las Caletas island and San Sebastian del Oeste, a small town in the heart of the Sierra Madres, near Cabo Corrientes and the Jardin Botanicos. One of my favorite day trips was to the islands of Yelapa and Majahuitas, located close enough to Vallarta to enjoy a full day, but far enough that it feels like another place in the world. With it’s deep blue waters, white sand beaches and a charming little town, Yelapa stole my heart from the moment I stepped off the boat. After enjoying a short hike to a small waterfall, where I took a quick swim in the icy, stone-lined pond, I enjoyed a slice of coconut-lime pie made by my new friend Victor’s tia. My visit to the historic city on Bahia de Banderas left such an impression on my heart after 10 days that I remember crying on the flight home, vowing to return to live in Puerto Vallarta someday. Fortunately for me, I don’t just dream things, I do them. And I did. Hotel Encino, at the corner of busy and convenient! I soon discovered, past the lush greenery of Hotel Encino’s picturesque lobby, a gigantic rooftop terrace with a swimming pool and incredible view, just a stair’s climb away. I grew to love the hotel staff, who made sure this single, female traveler felt safe and comfortable; their kindness and security also helped me to enjoy my stay. Having fallen in love with Yelapa on my first visit to Puerto Vallarta, I traveled there again, this time enjoying an entertaining night show of music and dance based on ancient tradition from the centuries-old folklore of the area. Presented in a stone-carved outdoor theater, the show was followed by a delicious dinner, and the evening ended with a relaxing lounge in a beachside fabric hammock. The greatest event of my visit in November was volunteering with La Brigada de la Basura at Que?Pasa Bar and Grill. If you ever want to get to know a city or it’s community, offering to be of service to them is probably the best way. I read about La Brigada in the online newspaper Bandera News, and emailed the owner and La Brigada founder Michael Hayes, who responded graciously about helping the kids on Saturdays cleaning Vallarta’s main tributary, the Rio Cuale. Of all the exciting tours, delicious meals and new discoveries, volunteering with the curious, fun kids of La Brigada is definitely one of the main reasons I wanted to live in Puerto Vallarta. 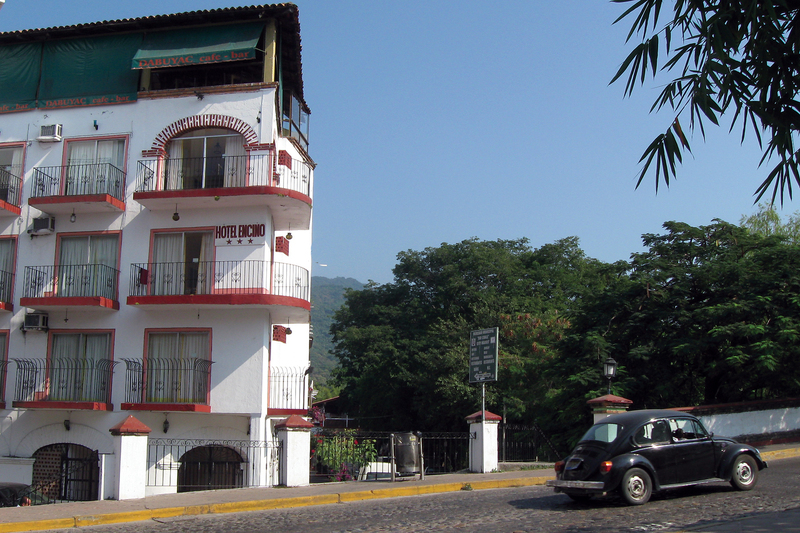 My third visit to Puerto Vallarta was in July of 2012, this time staying at Hotel Posada Roger on Basilo Badillo in Old Town. When I search for hotels, I prefer independently owned places with an attentive and friendly staff. Since I often travel alone, I look for a good one-person rate with a mid-sized room and a few added conveniences, all of which I found at Hotel Posada Roger, in a beautiful area just a few blocks from the beach. As my love for Vallarta grew with each visit, the third was also my second time volunteering, and the kids of La Brigada de la Basura welcomed me back with hugs and smiles. I ventured out on more tours, this time riding a mula up a montaña and zip-lining into a waterfall. I explored new neighborhoods, discovered unique places to shop, tried different local dishes, and made a few new friends. The urge to live here was so strong, I returned to the US and began planning my move. Celebrating my birthday. Thanks for the lift, Fernando! For four weeks I lived in Guadalajara, Jalisco, attending classes in TEFL certification with the International Teacher Training Organization, visiting nearby cities like Lake Chapala and Tequila whenever there was time. To celebrate our graduation in December, ITTO generously sent our class on a 5-day, 4-night vacation to Puerto Vallarta. Wanting to volunteer with La Brigada on the Saturday before the vacation started, I left early and traveled by bus, arriving at the Hotel Villa del Mar on a Friday night. A large, multi-leveled Villa del Mar is in a good location and though it lacks a pool, it does have a spacious rooftop terrace. The mid-size rooms are clean, and the location, in Colonia Emiliano Zapata, is a close distance to the beach and other attractions. Our class from ITTO took water taxis from the pier to nearby islands like Yelapa and Quimixto. Having watched the small-budget film “Which Way Por Favor?” after my last visit to Yelapa, I was anxious to see the sights I remembered and laughed about during this comedy-mystery based on the whereabouts of Don Juan de Marcos. (You can watch the movie free on YouTube in most countries). As much as I love visiting Yelapa, with it’s laid-back beach, mini waterfalls and mostly vehicle-free streets, my favorite adventure was, once again, Saturday morning seeing familiar faces and volunteering with La Brigada de la Basura. Reunited with my fantastic friend Calamardo and la chica de la Brigada! By my fourth visit to Puerto Vallarta, I was figuring out ways to make it possible to live there. The lively atmosphere stirred by tourism, the festive, happy lifestyle adapted by ex-Pats and “snowbirds,” and the tranquilo lifestyle mixed with steady work ethics all attracted me to making it my home. In the Spring of 2013, after living briefly in Tlaquepaque, I secured a job teaching in a private school in Puerto Vallarta. Ask. Believe. Receive. The view from my front door in Puerto Vallarta. I found an incredible apartment in a great neighborhood and began living my dream, grateful for every beautiful sunset that fell on another day in paradise. Unfortunately, I had to leave Puerto Vallarta earlier than anticipated, but I am certain I will return one day to enjoy this friendly, safe Méxican ciudad that feels like home.